Macrolane™ VRF, which stands for ‘Volume Restoration Factor’, is a new product offering from Q-Med (now part of Galderma), the makers of the highly successful Restylane® dermal filler range. Macrolane uses the same patented NASHA™ (Non-Animal Stabilised Hyaluronic Acid) technology as Restylane® to produce a thicker, more viscous hyaluronic acid gel designed to be injected into the body with long lasting results and no migration. Macrolane was discontinued by the company for breast indications in 2012 and has subsequently been taken off sale in the UK. Non-animal stabilised hyaluronic acid (NASHA) gel. It is currently indicated and CE approved for ‘volume restoration and shaping of body surfaces’, for example, shaping of the breasts, calves and buttocks and also for evening out discrepancies in skin surface such as those sometimes caused by liposuction. 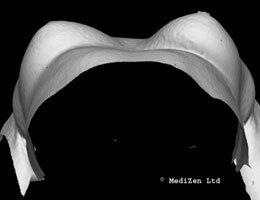 The manufacturer has decided to discontinue the breast indication for Macrolane until consensus for best practices in breast radiology examination following Macrolane treatment has been reached. For more information on this, please read our Blog. Only physicians who have undergone specific Macrolane training, provided by Q-Med can use Macrolane. It is important that you ask to see their training certificate to check that the physician is able to carry out your treatment. Ideally treatment for the breast reshaping indication should be carried out by a qualified cosmetic or plastic surgeon who has experience of traditional breast augmentation procedures and the anatomy involved, as well as having had bespoke training with Macrolane. The product range includes two different formulations - Macrolane VRF 20 and Macrolane VRF 30, with VRF 30 providing increased volume over VRF 20. These formulations can be used separately or combined to achieve an optimum result. Treatment, lasting 30 – 45 minutes, involves a small 2-3mm incision in the area, (e.g., normally the crease under each breast or buttock), and the injection of the substance using a thin cannula or large gauge spinal needle deep into the subcutaneous skin layer above the muscle, under local anaesthetic. Often a course of antibiotics may be prescribed both pre and post treatment to reduce any possible risk of infection. In the case of breast reshaping the product is placed underneath the breast tissue, much like an implant, so does not threaten the functioning of the breast in the event of future breast feeding. Due to its formulation it cannot and should not however be used on areas of the face. According to Q-Med, Macrolane is intended to last for 12-18 months in the body, depending on the area treated and the amount of volume used, although it recommends that each individual treatment programme includes a yearly top-up, as required, to maintain the optimal results, and that potentially over time this top-up may reduce in quantity. It will be some time however before long term data on the average duration for particular indications is properly known. Mild bruising, swelling and slight discomfort in the area are expected during the first few days post treatment but should all resolve within a week. Depending on the area treated, physical activity may need to be restricted for a couple of weeks and a support garment worn, such as a sports bra or lycra cycling shorts. Scars from the points through which Macrolane are injected are very small (as indicated by the arrows below in a patient just 7 days following treatment), and will often fade over a period of months - becoming barely noticeable. Photograph courtesy of Dr. David Eccleston M.B. Ch.B. B.A.C.D at MediZen Ltd. This depends on area treated and the amount of product used to achieve the desired result, as well as the practitioner doing the treatment. Q-Med quotes that typically an initial breast shaping treatment using 200ml (100ml for each breast) will cost in the region of £2,800, with top-up treatment in a year`s time in the region of £1,400. Although they note that the cost of the top-up treatments is likely to decrease because less of the product will be needed over time to maintain the optimum results. Click for ALL Macrolane™ VRF clinics in the UK & Ireland registered and verified by Consulting Room.